The ladies behind Instagram phenom Yes Way Rosé suggest 12 pink wines to stock up on for this Memorial Day weekend. Two summers ago, Erica Blumenthal and Nikki Huganir, best friends since high school, fell hard for Provençal rosé. Blumenthal, a fashion writer and Huganir, a graphic designer in the fashion world, weren’t involved in wine – they just loved to drink it and rosé became their thing. They launched an account to chronicle their enthusiasm, Huganir designed some and was born. Here, their picks for a dozen rosés that will make your Memorial Day weekend that ultimate dream. “This one’s from Richard Betts, who wrote the Essential Scratch & Sniff guide to Becoming a Wine Expert. It’s definitely a modern Provence-style rose. We first had it at a restaurant in Boulder called Oak at 14 and it was really a wonderful, delicious compliment to the meal,” says Huganir. “We eat everything with rosé. I think that’s one thing that we love and maybe people don’t know about rosé. It’s so flexible and can be paired with lots of different foods. We love it with pizza. “It’s not the sort of wine we’d wouldn’t take casually to the Rockaways,” say Huganir. “I guess we can just really relate to this one,” Blumenthal says. “We are definitely drunk in love with rosé. It’s an Oregon wine, a blend of Chardonnay and Pinot Noir. It has lots of berry aromas and even a hint of kiwi! “We love everything that the winemaker, André Mack, is doing. His OPP is one of my favorite wines ever. Other People’s Pinot? Genius! I’m definitely into the label design. André does all the labels, too and as a graphic designer, too, I’m like: RESPECT,” says Huganir. 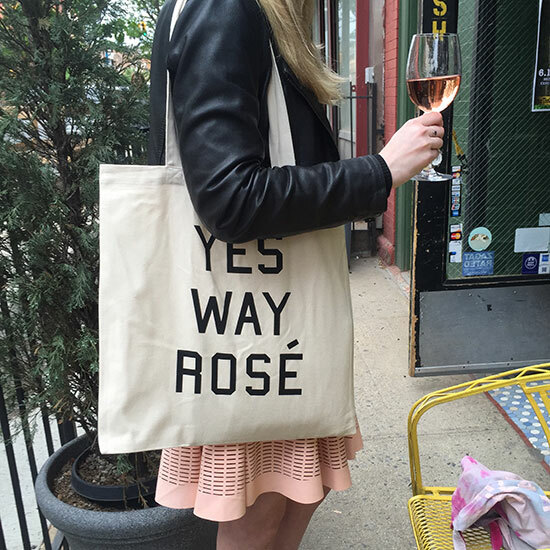 “We have one favorite rose wine store and it’s in Greenpoint in Brooklyn. We go there a lot and we never leave without something. And they even have 4 or 5 different boxed rosé options, says Blumenthal.